With a complex of over 300 caves and a 116km-long coastline with white sand, the central province of Quang Binh is becoming a popular destination in the so-called “Central Region Heritage Road”. About 50km northwest of Dong Hoi City is Phong Nha – Ke Bang National Park which is known as a “Kingdom of Caves”. 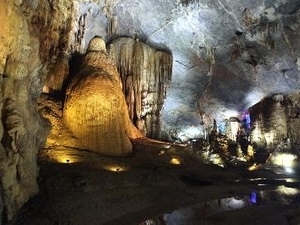 Besides the rich fauna and flora, the park is attracting local and international tourists for its numerous caves, such as Phong Nha, Tien Son, Thien Duong, Toi, En and Son Doong. Electric cars will take visitors through hundred-year-old forests to Thien Duong Cave. In 2005 the British Caving Association conducted a research on this cave and announced that it is the longest cave in Asia. The beauty of the stalactites and stalagmites in different shapes on the ceilings and the floors gives it the name Thien Duong (Paradise). However, only the first 1km in the cave is open to visitors. Exploring farther requires some specialized equipment. Further southwest of Thien Duong Cave is Sinh Ton Valley, 15km from Phong Nha Cave. The primeval forest covering 2,000ha is really a “living museum” with historical, geological and geomorphologic values and high biodiversity in flora and fauna which have been well preserved. Over the past 10 years, three million people visited Phong Nha – Ke Bang National Park. The management board of the park has been organizing activities to promote tourism, such as holding exhibitions in Germany and Laos and coordinating with television film studios in Brazil and Hong Kong to make films on the caves. The management board also signed with some travel companies to offer ecological and adventure tours to attract more tourists to the park in the near future. Quang Binh province borders the East Sea , with a coastline dotted with peaceful white beaches sloping into the blue sea. Among them, Nhat Le Beach has become a familiar destination for tourists on summer vacations. Located near the Nhat Le River, the beach slopes gently and is an ideal and safe place for playing and swimming. Nguyen Du and Truong Phap Roads run along the coast, leading to historical relics and scenery, such as the vestige of Tam Toa Church, the monument dedicated to National Heroic Mother Suot, and the archaeological site of Bau Tro. All these contribute to attracting tourists to Nhat Le Beach.